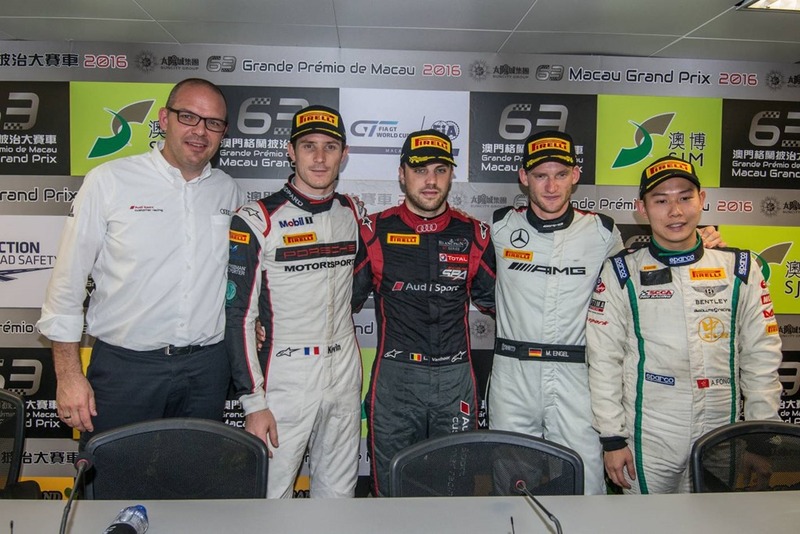 Ingolstadt/Macau, November 20, 2016 – Audi Sport customer racing with Belgian Audi Club Team WRT has won what has arguably been the most unusual GT race in Macau. 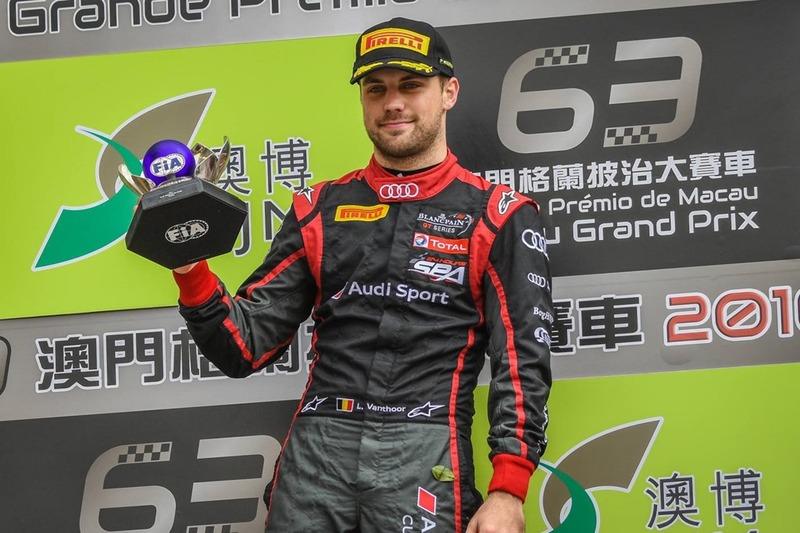 After the race had been stopped twice, Laurens Vanthoor decided the FIA GT World Cup in his favour for the first time. Following his victory in the qualification race on Saturday, Laurens Vanthoor had started the decisive title race as the favourite on Sunday. The 25-year-old Belgian was leading the race from pole position up until it was stopped for the first time when a track barrier had to be repaired following a minor accident in the midfield. Shortly after the subsequent restart, Laurens Vanthoor in the Mandarin Oriental corner ran over the inner curb, lost control, touched the guard barrier on the opposite side and rolled over. He climbed out of the Audi R8 LMS that is designed for extreme safety unharmed and shortly afterwards even mounted the podium. Following the red flag, the race control had no choice but to not restart the race due to the time that had elapsed by then, and classified the positions held after four completed laps. 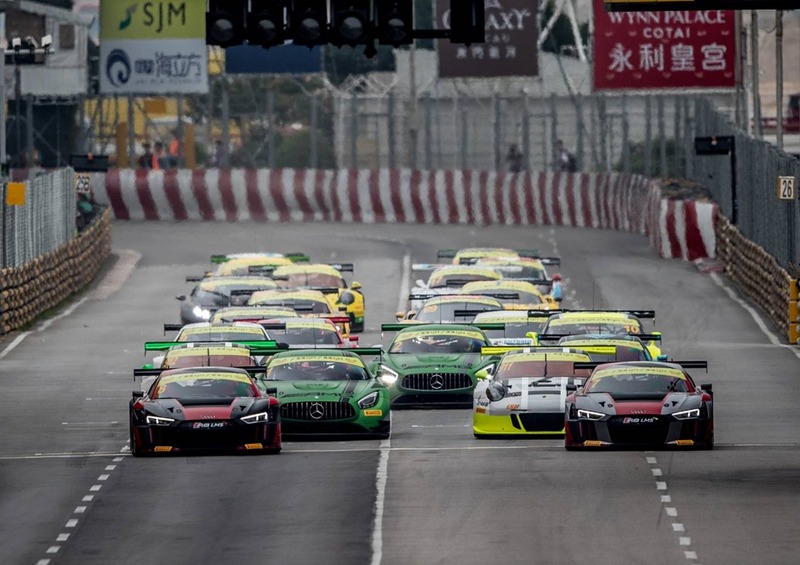 After 2011, 2012 and 2013, Audi has won the race in the narrow street canyons of the Asian metropolis for the fourth time. “I’m happy and relieved about not having been injured,” said Vanthoor, who has won three international GT titles with Audi before. Fabian Plentz from Hanover finished as the second-best driver of an Audi R8 LMS. The 28 year-old Macau rookie from Team HCB-Rutronik Racing took position eight overall, making him the third-best driver in the group of entrants not to have been nominated for the manufacturers’ classification. Plentz had won the DMV GTC racing series in the Audi R8 LMS in October. Chris Reinke, Head of Audi Sport customer racing, was delighted about Audi’s fourth victory in Macau and the first World Cup title of the R8 LMS. The two DTM campaigners Edoardo Mortara (Audi Sport Team WRT) and Nico Müller (Phoenix Racing Asia) had already lost their chances of clinching a good result in the qualification race on Saturday. Mortara had started from pole position, but dropped to 13th place following an accident. On Sunday, from grid position 16, he advanced to 13th place. At the end of the year, the current DTM vice-champion is going to switch from Audi to Mercedes. Müller was not able to start on Sunday because his Audi had been too heavily damaged in an accident the day before. In three weeks’ time, Laurens Vanthoor and his teammates will be battling for another international title for Audi, the 12-hour race at Sepang coming up in Malaysia. Before the finale of the Intercontinental GT Challenge, the Belgian is leading the drivers’ standings with a six point advantage.